For the second time triple j Breakfast presenters Ben and Liam have stormed an unsuspecting high school to surprise the Unearthed High winner – but this time they added a fiery twist. 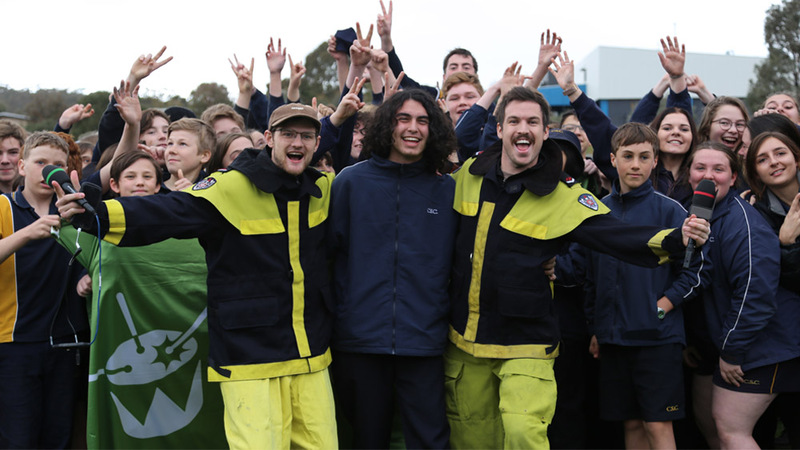 The boys snuck into Castlemaine Secondary College under the guise of a fire drill and dressed as firefighters to let 16-year-old singer-songwriter Kian know that he had taken out the big prize. Kian won for his single ‘Waiting’, he’ll now be flown to the triple j studios in Sydney to professionally record the track and receive industry mentoring from unknown figures that will be revealed this afternoon on Veronica and Lewis. Amazingly enough, despite having no official singles released, Kian has appeared on the youth station’s Hottest 100 countdown before. The singer provided backup vocals for Baker Boy’s hit song ‘Cloud 9’which came in at #76 on this year’s countdown. Kian met Baker Boy through the Indigenous Hip Hop Projects, an initiative which his father runs which engages Indigenous youth in a variety of musical programs. Best vid from Triple J I’ve seen in a long while. Good luck to Kian he hopefully has a bright future.